I am happy to join you today for the Inaugural Ceremony of the Eleventh Congress of the Asian Pacific Postal Union, an inter-governmental organization of 32 countries of the region. This august body is actively working to improve cooperation among member nations in the field of postal services. I am glad that it has chosen New Delhi as the venue for its Congress, being held this year. I welcome all the delegates who have travelled far and wide to be a part of this important gathering of postal administrators. I also compliment the Department of Posts of the Government of India, for having painstakingly organized this major event. I am told the Congress meets every fourth year to revise the Acts of the Union and discuss postal issues. This Conference is significant as it is the first time this regional group is meeting after the Doha Congress of the Universal Postal Union held one year back. The deliberations over the next few days shall be instrumental in shaping the future of postal services in the Asia Pacific region. They will also provide a roadmap for the progress of the global postal sector. The Asian Pacific Postal Union has made a significant contribution to the postal sector in the region. This influential Union has a state of the art training facility at Asian Pacific Postal College, Bangkok. I am told that it is the only postal training college of its kind in the world. Through this institution, the Union has been successful in transferring modern management and operational skills to postal workers from member countries. It is gratifying to note that this college offers scholarships to the participants from less developed countries who want to attend its training courses. It has initiated various projects aimed at improving the quality of postal services. It coordinates with the Universal Postal Union for some of the projects. The Asian Pacific Postal Union has also been assisting the world body in technology induction in the region. This regional union has a Technology Centre to provide technical support to the member countries. Historically, postal administrations round the globe have played a critical role in communication and commerce. For years, post offices have offered traditional services like mail, banking, life insurance, money transfer and other retail services. With rapid changes in technology, other means of communication such as e-mail and facsimile have become increasingly important. The volume of letters sent by post has seen a steady decline over the years. At the same time, there is a rising public expectation about postal services conforming to the same standards of quality, accountability and transparency that are being provided by other market players. The changing global scenario calls for postal administrations around the world to think differently. They must be proactive to change. They must leverage their strengths to provide quality service to the people. Worldwide, postal administrations enjoy the trust of people. Having the benefit of an unmatched network, they are best suited to engage with the common man. Through their three dimensional network resting firmly on physical, electronic and financial pillars, post offices are in a vantage position to respond to people’s communication needs. Globalization and easier movement of workforce across nations have opened a great window of opportunity for the postal sector. With increasing requirement for remittance channels, it can, with the guidance of the Asian Pacific Postal Union, make a difference. In 2012, nearly sixty million migrant workers of the Asia Pacific region lived outside their countries of origin. These migrants remitted two hundred sixty billion US Dollars to their homelands. Such monetary transfers help in lifting millions of households out of poverty and in improving their living standards. Post offices and other agencies like banks, money transfer operators, micro finance institutions and mobile operators are key players who can contribute in developing the remittance market. The vast network of post offices is ideally placed to facilitate greater access to financial services for the people. There has been an increasing demand for communication services, for payment of utility bills, and for buying and selling of products and services through the information and communication technology platform. In the context of a growing digital economy, the changing customer expectation has made it imperative for postal service providers to innovate and develop services suited to their requirements. There is a huge scope for postal services to be engaged in e-commerce, and gain from the rising demand for such business products. As post offices are easily accessible to the community, it can devise a suitable model for allowing small producers and consumers to connect, both within and across national borders. What is needed within the sector is to determine the appropriate strategy and portfolio of services. I am confident that the Asian Pacific Postal Union, having an unparalleled reach through its three lakh fifty thousand post offices in the region, would be successful. Allow me to throw a word of caution here. Large networks alone will not guarantee sustainability and profitability. Post offices have to work with missionary zeal to improve their financial viability, technological capability and human resource ability. Service must be put before everything else. Every personnel working in the postal sector should remember what Mahatma Gandhi, the father of this nation, had once said. I quote: "Service that is rendered without joy helps neither the servant nor the served. But all other pleasures as possessions pale into nothingness before service which is rendered in a spirit of joy” (unquote). Communication has always been behind building and sustaining strong human relationships. Postal services have been an able facilitator to this for a long period of time. It must continue to do so in the future. Means of communication have evolved. This age belongs to people who want quick, reliable and user-friendly medium to communicate. The postal sector should take up this challenge and offer exciting and vibrant media that encompasses a wide spectrum of services. Postal administrators in different countries must view this as a great opportunity and make their systems robust to meet consumer expectations. The Asian Pacific Postal Union is suitably placed to not only address the concerns facing the postal sector but also to explore the untapped opportunities. This Eleventh Congress has been enriched by the participation of distinguished delegates from member countries. It will be crucial in evolving strategies and providing guidance to postal administrations in the region. I wish you all a very productive participation and comfortable stay in our country. 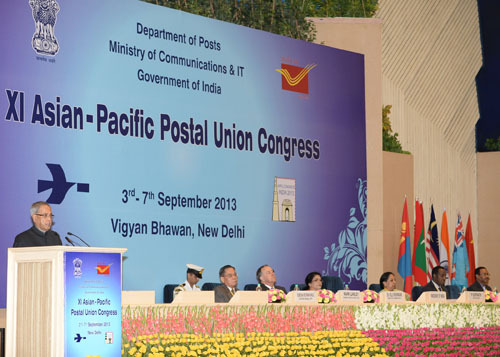 I now declare the Eleventh Congress of the Asian Pacific Postal Union at New Delhi open. I wish this Congress all success.